Read on to learn about the five ways you can turn your business into a paperless business – today. Inflation is creeping higher and Americans are helplessly watching their purchasing power vanish into thin air. Retirement funds dwindle while it gets harder to put food on the table. The dollar’s inflated to 10% and everyone’s worrying about buying things before they go up in price. Anxious consumers are purchasing goods the same way squirrels pack away nuts for winter. Problem is, this ever-consuming loop of fear is actually driving prices higher. Fear contributes to a rapid, debilitating buying cycle. And as prices go up, employees ask their bosses for a raise. Bosses comply with wishes, left with no choice but to raise prices. The result is a self-fulfilling prophecy of inflated prices. But here comes Paul Volcker, the newly appointed Federal Reserve Chairman. Notorious for his devil-may-care attitude and allowing his socks fall scrunched about his ankles, he’s intent to fix the economic mess. His way. Traditionally, inflation is supposed to stop once you stop printing money. Volcker’s stopped the presses, yet things just keep getting worse! Having iced the economy, we’re in a recession now too, and Volcker is facing an uproar. But he’s sticking to his principles, cool and collected. Winter is coming, heck, it’s already here – but the Fed Chair knows that a frozen economy must thaw before financial security springs anew. What did Volcker do to end the woes of inflation? He showed the American people that the problem was all in our heads. He didn’t succumb to convention, refused to print more money, and made us all stand firm. This is what allowed the dollar correct itself. We had to stop worrying and just accept things as they were for a season. By the end of a 1981, inflation dipped to 9% – then 6%, then 4%. Since then, inflation has been effectively non-existent. What does inflation have to do with the paperless office? The obstacles to a paperless office are in your head. Just like inflation. Paper consumption and papertrail headaches are a ‘mo’ paper, mo’ problems’ scenario in the modern office. 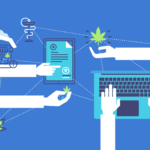 Since the “paperless office” was heralded in 1978, we’ve all looked ahead to a space-age time where we’d save trees and feel great about it – all while increasing efficiency and productivity. You still with me after that Doctor Who-style history lesson? Now in the present day, we’re enjoying a wireless age of information that empowers us to send, receive, and consume immense amounts of data formerly reserved only for sheets of paper. The internet and cloud platforms allow our ideas to circulate without boundaries, be they time, or space, or paper. And yet, companies in the US already spend more than $120 billion a year on printed forms, most of which are outdated in three months or less. The average office worker uses 10,000 sheets of paper a year. Businesses pay for this wasted paper, pay to file it, pay to search through it, and pay to have it tossed out when more space is needed. By comparison, the internet creates almost 3 million blog posts each day, but we never have to print those files. They simply exist, or can be stored and sorted as we see fit. Imagine if we printed all the articles we read and circulated. How much would that cost? You’d need to print and distribute each Word file, Google Doc, Adobe Acrobat PDF, and Adobe Reader you read all year. That’s an unrealistic, costly number. This is the beauty of the paperless office: infinite informational capability, zero limitations. So here’s the five best ways to move forward to this paperless reality. According to a recent AIIM survey, 59% of respondents said that the biggest driver of paper consumption is meetings. The second highest user of paper was signatures. If you’re serious about a paperless office, start in the meeting room. Printouts for each employee across every meeting adds up fast, yet most documents are trashed immediately afterwards. While paper is flexible, portable, and easy, the same is true of modern technologies. 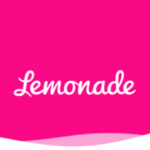 For example, Doodle and SurveyMonkey provide free service for conducting and scheduling meetings. But what about all the printouts during the meeting? Try TeamViewer to conduct paperless meetings. This powerful office package gives you remote access to office computers 24/7 through any computer or mobile device. It also includes features for screen sharing during presentations, transmitting videos, sharing files, accessing whiteboards, and teleconferencing. TeamViewer lets you avoid handouts by simply hijacking your colleagues’ laptop while you’re showcasing an idea. Then easily upload the slides to Dropbox or Basecamp so everyone gets access to the digital copy. Now everyone can reference ideas on the fly and there’s nothing lost. When it comes to meetings and printouts, good technology puts an end to the printout cyclone that surrounds every meeting. Remember the classic Seinfeld episode when George Costanza loses his fiancé to postage stamps? I’m sure your company is doing better than dear ol’ George, but my point is you needn’t stress over such minor things anymore. The more online bill paying you do, the less you’ll shell out for postage, envelopes, and employee time (and potential damages) spent on invoicing, checks, and mailings. Office finances that run through the web make sure payments are prompt, immaculately recorded, and easily tracked. Business at the speed of paper is no longer efficient for many, especially when we consider the file shares, mobile, and social collaboration platforms in the competitive space. Many merchants turn to apps like Square to process payments through smartphones. 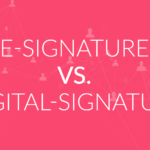 With recent developments in digital signature technologies — like Signority — getting bills paid and approved via eSignatures has never been easier. And studies show that consumers would rather receive paperless receipts through email than in hand. Plus, think of all the papercuts you can spare your valued employees. If your business is located in a major urban center, space is a key concern. In terms of rent per square foot, storing thousands of paper documents in San Francisco, Manhattan or Toronto can skyrocket office costs. Instead of renting additional office space for storage, convert files and have them stored on secured off-site servers or in the cloud. The latter option will be much cheaper. And easier to access. Turn to PDF converters make the transfer process easy, PDF editors that allow you to make changes, and PDF readers to allow easy access to documents. Plus, you’ll save on the costs of disposing of sensitive materials. A few companies in the digital signature space also provide their customers with full-fledged storage and document management solutions, as part of their monthly package. With paperless storage, you’ll be able to access documents easily through keyword searchability as well, no more rummaging through file bins and back rooms. Digitally thumbing through thousands of documents is both cost and time effective for employees. This will also decrease the likelihood of losing valuable data. Yes, scanning and faxing is still highly prevalent among businesses. The paperless office saves on ink, paper, and hassles by eliminating the physical component by sending and storing documents seamlessly. The initial hesitation for many companies is that shuffling documents through a scanner will be less efficient than paper copies and cost in terms of employee work hours. But costs are already through the roof. Reduce.org reports that the cost of using paper in the office costs between 13x – 31x the costs of actually purchasing paper. As Xerox reports, the US already spends roughly $460 billion in salaried time to simply manage paper-driven information overload. Meanwhile, effortless digital solutions are abundant in this space. For example, Turboscan is an excellent app that allows phone cameras to be used as scanners which then convert captured images to PDFs for easy-send emails or upload to Signority for grabbing that quick eSignautre. For only $15 per month, eFax takes incoming faxes and puts them into your email box and paperless, easily-searchable emails. Sending files instantly is the best aspect of a paperless office. If you’ve got multiple offices, accessing relevant documents from anyplace is truly a revelation. And connectivity is only getting better. With the ever increasing internet of things, data usage and storage rates are up. Data accessibility is expected anywhere at anytime and streaming data is a given between more and more devices. Quocirca’s recent report finds that 72% of enterprises surveyed already have “some paper-free processes in place and are planning to implement more.” Why? Because the companies that go digital create opportunities to spot bottlenecks and inefficiencies in their workflows while maximizing productivity and using fewer material goods. In coming years, paperless offices will mesh with home offices. As the prevalence of AI increases, so will the use of private contractors and employees who work from home. Yes, telecommuting and working from home will signal a substantial reduction in paper and office costs for businesses, but more happier, more effective employees too — we know, contractors are a huge part of the Signority workforce. As a Global Workplace Analytics study reveals, two-thirds of employees would take advantage of the opportunity to work from home, and 36% said they’d rather telecommute than receive a raise. Sharing documents with cloud-based platforms will have increasingly positive impacts for between workers, managers, and even clients. For businesses moving with digital trends, digital signature services complete the paperless office model and Signority provides an affordable solution for seamless integration into your business process. A modern agile business means agile data, accessible from anywhere — even when it comes to connecting pen to paper — when every level of business is able to exchange signatures and data fluidly, companies can move forward at lightspeed. These days, technology is inflating the capacities and capabilities of businesses in a big way. And like a balloon set to rise, integrated technology promises a positive impact upon how far businesses can stretch their money. From cloud platforms to handheld apps, it’s no secret that businesses directly benefit from being more connected and more effective than ever. In coming years, we’ll see the best companies enjoying increased productivity, reduced costs, and a competitive advantage as a result of a move towards the paperless office. As environmental concerns stay top of mind, companies with the paperless office will enjoy a boost in their bottom line. Value-conscious consumers eager to change the world with their purchasing power are always happy to endorse the green company with the paperless office. Will your company catch the trend upwards? Looking to go paperless? 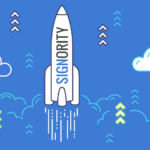 Sign-up now and get free access to Signority’s Business Plan.